The overall health in Sarasota Bay degraded slightly in 2016, changing from the previous year. Chlorophyll a showed a clear increase, while phosphorus and nitrogen slightly decreased. Water Quality: Two of the three water quality indicators (nitrogen and phosphorus) were rated as excellent (below their respective targets). However, chlorophyll a exceeded the target and threshold values. The mean for chlorophyll a was calculated as an arithmetic mean and the means for nitrogen and phosphorus were calculated as geometric means (per the Numeric Nutrient Criteria outlined in the Florida Administrative Code, section 62-302.532). Mean chlorophyll a concentration was 0.0067 mg/l, above the target value of 0.0052 mg/l and the threshold of 0.0061 mg/l. The mean concentration of total nitrogen decreased marginall6 to 0.3528 mg/l, still below its target value of 0.51 mg/l . Mean total phosphorus concentration increased marginally, but at 0.0639 mg/l was still well below its target value of 0.150 mg/l. Biotic Indicator: A survey of the biotic indicator, seagrass, was performed in 2016 by the Southwest Florida Water Management District. 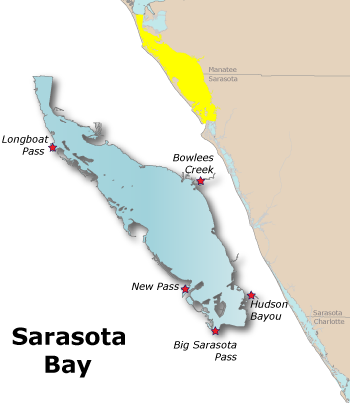 In 2016, the total area of seagrass in the lower portion of Sarasota Bay (the area within Sarasota County) was estimated to be 3,639 acres, well above the target of 2,022 acres.